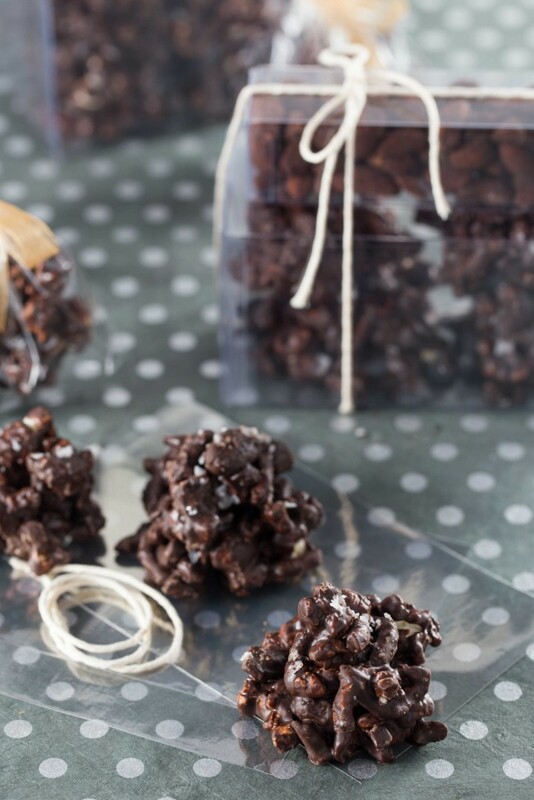 Sweet and Salty Chocolate and Peanut Clusters are an easy, no-bake treat for the sweet and salty fan in your life! Hey folks. I’m back today with a really fun and delicious recipe that you really need to make for shalach manos. But let’s back up a minute, shall we? Remember about a month ago, when I introduced you to a new company called Crafted Kosher? Well. The Pastrami Wrapped BBQ Chicken Fingers that I shared in that post have kinda gone viral. I think about a million people have made them, and they all R.A.V.E. So in today’s post, where I’m once again partnering with Crafted Kosher to help you discover their extensive selection of kosher food finds, I kinda felt the pressure to pull out all the stops and come up with something really amazing. And let me tell you…mission accomplished. I’m obsessed with these, and you soon will be too! In fact, I brought a box of them over to my sister today, for sampling, and she had to fight with her two year old to leave her some! 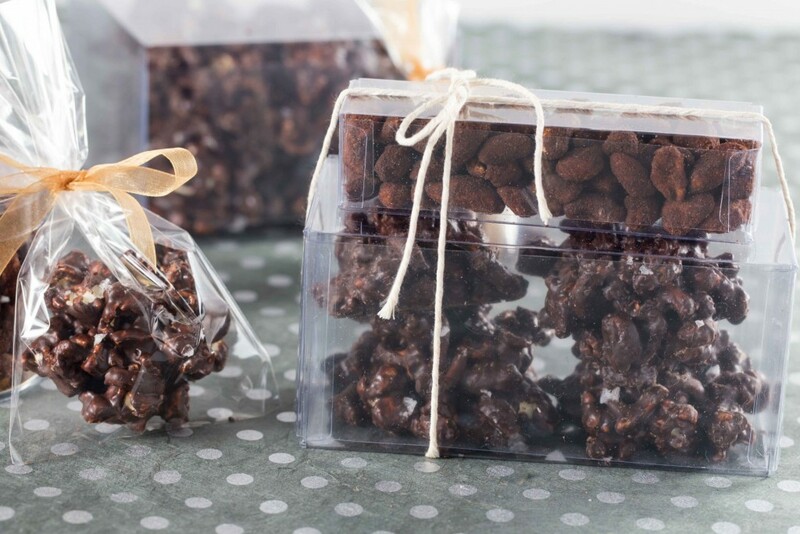 These Sweet and Salty Chocolate and Peanut Clusters are not just no-bake. They’re also delicious and incredibly easy to make… and did I mention, absolutely perfect for your shalach manos? On the topic of shalach manos, I want to tell you about my partner in today’s post, Crafted Kosher. Not only do they sell an incredible selection of unique kosher food, but they’re also stocked with a huge selection of shalach manos baskets that aren’t just beautiful, but they’re chock full of deliciousness! If you’ve got a friend who’s a foodie, you really need to browse their shalach manos selection to find the one your friend will like best. Meat lover? Get this! Chips and dips lover? Done. Gluten free? They got you! Chocoholic? Of course! If you’ve got a friend who doesn’t live nearby, this is perfect: order them a unique basket of goodies on Crafted Kosher, and they’ll ship it straight to their door! Browse their entire selection of purim baskets and goodies here. 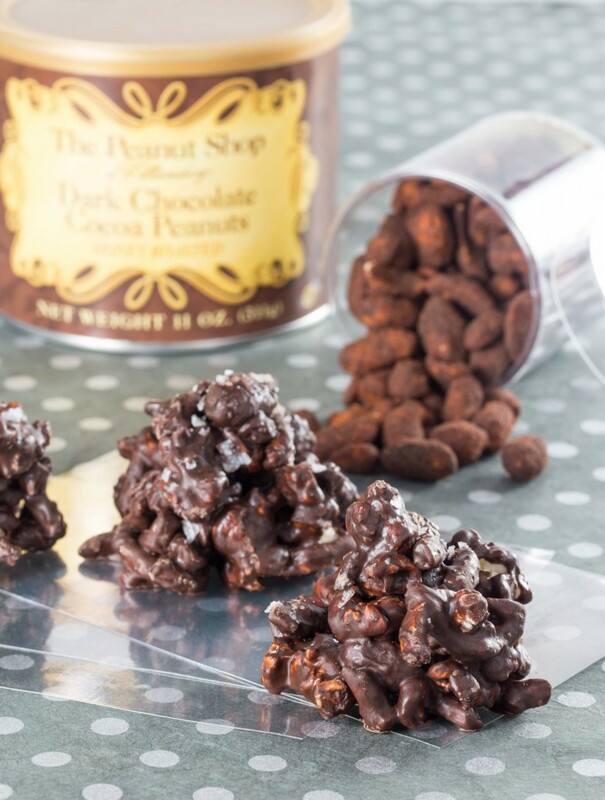 One of my favorite finds on Crafted Kosher so far were these Honey Roasted Dark Chocolate Cocoa Peanuts. These peanuts are salty, then honey roasted, so they’re sweet, then coated in cocoa, so they have a touch of bitterness as well. All together, it’s a perfectly balanced blend of flavors that I can’t get enough of. Naturally, I needed to create a recipe that features these delicious little treats! 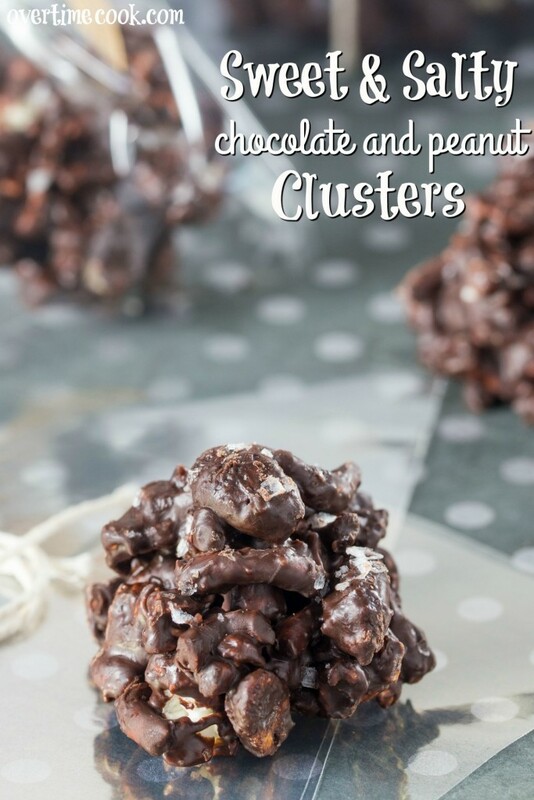 My Sweet and Salty Chocolate and Peanut Clusters follow the theme of the peanuts I love so much: they have all kinds of sweet and salty flavors happening – it’s like a party in your mouth! coarse sea salt, optional, for topping (for best results, use this one or this one. Combine popcorn, pretzels and peanuts in a large bowl. Set aside. Combine melted chocolate and melted peanut butter chips in a medium bowl and stir until smooth. 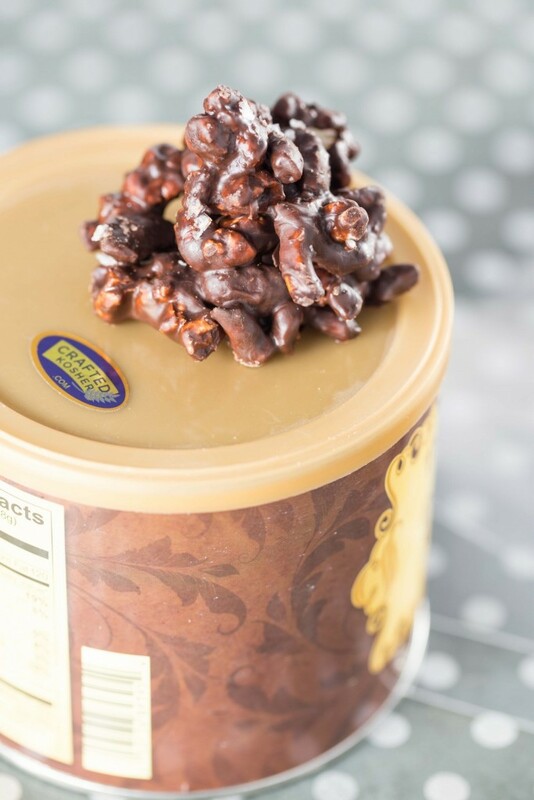 Pour the chocolate mixture over the popcorn mixture and stir until everything is coated. Spread out a sheet of parchment paper on a cooking sheet or flat surface. Use two spoons to scoop out some of the chocolate covered mixture and place into a little mound on the parchment paper. Sprinkle sea salt over the top of the mound, then do not touch it until the chocolate hardens completely. Repeat with remaining mixture until it has all been formed into clusters. Note that while the chocolate is still hot, the pieces won't stick to each-other much, but if you place them into a mound and leave them, they'll harden into a nice cluster. Use this to your advantage and shape the clusters as you please. Once clusters have cooled completely (about 20 minutes), remove them from parchment and place in a sealed container until ready to serve. Start by adding a couple of tablespoons of oil to a pot that has a tightly fitting lid. Place it on a medium flame. Place one kernel in the pot and wait for it to pop. Once it pops, that tells you that the oil and pot are hot enough. Add corn kernels to the pot (the quantity will differ based on the size of the pot) and cover it. Next, shake the pot, pretty frequently, as you hear popcorn popping inside of it. Once the popping noise slows to a couple of seconds in between pops, turn off the flame. Now you can add salt, or have some fun and add all kinds of spices. The quality of the kernels you use will make a big difference to the final result, which is why I’m excited to have discovered this incredibly delicious India Tree popcorn. Want to have a little fun? Try the three colored popcorn! Disclosure: This post was sponsored by Crafted Kosher, a new brand that I genuinely love, and am proud to partner with. Thank you for supporting the brands I love that help make this blog possible. All opinions are 100% my own. This post contains affiliate links, which means that a small percentage of every purchase made through these links goes to support my blog. i grew up with it, and it’s the best. Oh. Wow. These sounds so delicious!